Out of Earshot will not tolerate discriminatory behaviors or attitudes of any kind at our events. If you are made to feel uncomfortable for any reason we encourage you to come speak with an organizer (when you feel it’s safe to do so) and we will do our very best to take appropriate action to address the situation. -Eastern Edge has an entrance accessible via ramp. The front entrance and washroom doors are not motorized. -Some seating will be provided. -This event is wet/dry and ID will be required to access the bar. Out of Earshot strives to offer some exclusively dry events in the future. This venue is not accessible. Limited bar seating is available. 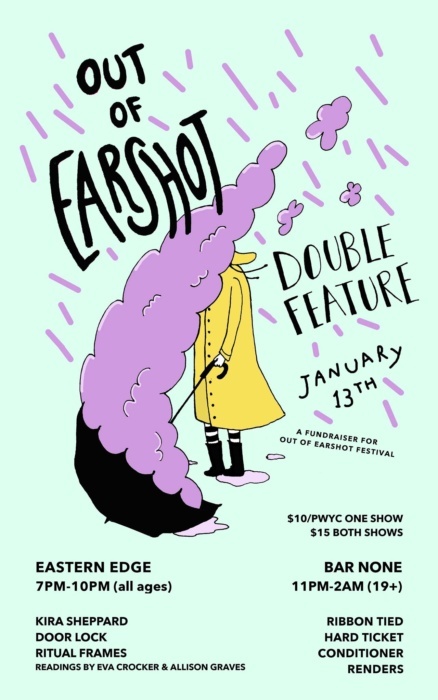 Out of Earshot is an independent multidisciplinary festival dedicated to showcasing DIY and emerging Canadian music and art. As a festival, we aim to create welcoming and supportive spaces for the performance and appreciation of multiple art forms. For more information about accessibility, to send us your ideas or to get involved email outofearshot.fest@gmail.com. We will have a website and social media up and running very soon to keep you up to date on future events! Thanks for your support!